"Rising federal spending and huge deficits are pushing the nation toward a financial and economic crisis. Policymakers should find and eliminate wasteful, damaging, and unneeded programs in the federal budget. One good way to save money would be to cut subsidies to businesses. Corporate welfare in the federal budget costs taxpayers almost $100 billion a year. "Policymakers claim that business subsidies are needed to fix alleged market failures or to help American companies better compete in the global economy. However, corporate welfare often subsidizes failing and mismanaged businesses and induces firms to spend more time on lobbying rather than on making better products. Instead of correcting market failures, federal subsidies misallocate resources and introduce government failures into the marketplace. "While corporate welfare may be popular with policymakers who want to aid home-state businesses, it undermines the broader economy and transfers wealth from average taxpaying households to favored firms. Corporate welfare also creates strong ties between politicians and business leaders, and these ties are often the source of corruption scandals in Washington. Americans are sick and tired of "crony capitalism," and the way to solve the problem is to eliminate business subsidy programs. "Corporate welfare doesn't aid economic growth and it is an affront to America's constitutional principles of limited government and equality under the law. Policymakers should therefore scour the budget for business subsidies to eliminate. Budget experts and policymakers may differ on exactly which programs represent unjustified corporate welfare, but this study provides a menu of about $100 billion in programs to terminate." The paper includes several charts that you can use when writing to your Members of Congress. As deHaven closes the paper's conclusion, "When Congress does start cutting, corporate welfare should be high on the list." Now if we can just get Congress to start cutting! “Wilson was the first president, as well, to indulge in the now-familiar celebration of political “leadership,” a term the Founders had regarded with suspicion, never more so than when that leadership was “visionary.” Presidents prior to Wilson had spoken to the public on rare and brief occasions. “Even most of the inaugural addresses avoided politics in the sense of policy agendas or partisan appeals,” Kesler writes. Wilson began the chatterbox presidency, which would in time yield presidents (and senators, like Obama at Knox College) who tell us all about the futures they “see.” They also tell us about the crises we must pass through to get there: Wilson argued that leaders should keep the public in a sense of crisis at all times, the better to perfect the beehive. "Like Wilson, whom he revered, FDR was impatient with the Constitution. In his first inaugural address he suggested that it might be a good idea for Congress to grant him “broad executive power to wage a war against” the Depression. FDR said he would use his power to engage in “bold, persistent experimentation,” and ever since then pragmatic improvisation has been part of the liberal self-image. It was always a canard: FDR’s policies were mostly nostrums retrieved from the Progressive shelf, and few of them were ever discarded except under duress. In support of Ponnuru’s assertion that until President Wilson, presidential addresses to the public were “rare and brief,” Gerhard Peters says in a research note at The American Presidency Project that “beginning with Jefferson's 1st State of the Union (1801) and lasting until Taft's final message (1912), the State of the Union was a written (and often lengthy) report sent to Congress.” Seems reason enough for returning to the ways of the Founding Fathers. "There's a belief among policy makers that serious recessions associated with financial crises are necessarily followed by slow recoveries—like the one we've experienced since mid-2009. But this widespread belief is mistaken. To the contrary, U.S. business cycles going back more than a century show that deep recessions accompanied by financial crises are almost always followed by rapid recoveries. "The mistaken view comes largely from the 2009 book "This Time Is Different," by economists Carmen Reinhart and Kenneth Rogoff, and other studies based on the experience of several countries in recent decades. The problem with these studies is that they lump together countries with diverse institutions, financial structures and economic policies. They also conflate two different measures of speed—how long it takes a country to get back to its previous business-cycle peak, and how fast the economy grows once the recovery has started." "In a recent working paper for the National Bureau of Economic Research, Joseph Haubrich of the Federal Reserve Bank of Cleveland and I examined U.S. business cycles from 1880 to the present. Our study not only confirms Friedman's plucking model but also shows that deep recessions associated with financial crises recover at a faster pace than deep recessions without them. "We measured the depth of a contraction by the percentage drop in quarterly real gross domestic product from peak to trough. We measured the strength of the recovery in several ways: first as the percentage change in quarterly GDP in the first four quarters after the trough, then also looking further into the expansion. So, for example, since the 1920 recession lasted six quarters, we looked six quarters into the subsequent expansion. "We found that recessions that were tied to financial crises and were 1% deeper than average have historically led to growth that is 1.5% stronger than average. This pattern holds even when we account for various measures of financial stress, such as the quality spread between safe U.S. Treasury bonds and BAA corporate bonds and bank loans." The Wall Street Journal sub-titled the op-ed this way: "The evidence since 1880 shows a faster pace of recovery. The Obama years are the exception." Friends of Growls are encouraged to read the entire op-ed so they can respond appropriately the next time they are confronted with the excuse the current recovery is "different." Tony Lee reports at Breitbart/Big Government on the burden of "regulations, taxes, government spending, and the increasing cost of health insurance and energy. Lee cites a new survey and writes that "under President Barack Obama’s administration, a majority of small business owners and manufacturers believe the economy is in a worse position for them to succeed than three years ago." "Nearly 70 percent of small businesses and manufacturers surveyed said Obama’s regulatory policies have hurt them and there was too much uncertainty in the economy to expand. Over 50 percent of those surveyed said they would not start a business in today’s economic environment, and foreign countries like China and India are more supportive of small business and manufacturers than the United States. "Public Opinion Strategies (POS) surveyed 800 small business owners, manufacturers, and decision-makers at small and medium-sized companies on behalf of the National Association of Manufacturers (NAM) and the National Federation of Independent Business (NFIB). POS conducted the interviews August 13-September 4. Kudos to Tony Lee and Breitbart/Big Government for reporting this story. Is it any wonder "(t)he Commerce Department revised real GDP growth in the second quarter of 2012 down to 1.3% from the previous 1.7% estimate," according to The Street this afternoon. UDATE (9/29/12): Annie Yu adds a few more details at Daily Caller, e.g., "that 69 percent of them think President Barack Obama’s policies have hurt American businesses and manufacturers, and 55 percent would not start a business today given the current environment." Hello “Fact-Checkers.” Where are you? "There are a variety of possible ways to measure the tax burden on American “families” over the past 50 years. Fortunately, Mr. Obama’s own White House Office of Management and Budget provides a spreadsheet that summarizes federal tax receipts from 1940 through the present. Fifty years ago, in 1962, federal tax receipts were $99.7 billion. In 2011, they were $2.3 trillion. Far from being at a 50 year low, the taxes extracted from American families last year were about 23 times what they were fifty years ago. "Okay, but aren’t there more families in America now than there were 50 years ago? Sure. The 1960 Census counted about 179 million Americans, while the 2010 Census counted about 309 million. The population hasn’t even doubled, but the federal government’s tax receipts have increased 23 times. "Okay, but what about inflation? President Obama’s own Office of Management and Budget tries to deal with that question by using something called “constant (FY 2005) dollars.” It’s not as trustworthy a measure as, say, the price of gold, but since the White House uses it, it’s worth at least a look. By this measure, federal taxes climbed to nearly $2 trillion in 2011 from about $660 billion in 1962. In other words, the taxes trebled, even as the population didn’t even double. "Remember, too, that 1962 wasn’t some kind of blissful Jeffersonian small-government era to which we can never possibly return. It was the height of the Cold War. President Eisenhower had only shortly before warned of the military-industrial complex. President Kennedy was going around giving speeches about how the tax burden was too high." "It would be a shame if voters fall for Mr. Obama’s misleading claim that their taxes are at a 50-year low. But who can blame the voters, or, for that matter, the fact-checkers, if even Mr. Obama’s opponent, Mitt Romney, buys into the idea. In the same “60 Minutes” program, Mr. Romney said taxes would remain essentially unchanged if he won. “I don’t want a reduction in revenue coming into the government,” Mr. Romney said. "It’s enough to make one nostalgic for George W. Bush, or at least to prompt one to wish for a politician who can articulate the tax issue not in terms of what it means for the government’s revenues but in the language of what it means for the individual." Kudos to Ira Stoll and to Reason magazine for this execellent "fact-check" analysis of the President's tax claims. "The 2012 Congressional Pig Book is a proverbial “good news, bad news” story. The good news is that, according to CAGW’s criteria, the number and cost of earmarks have decreased dramatically since fiscal year (FY) 2010, when the last Pig Book was published. The number has dropped by 98.3 percent, from 9,129 in FY 2010 to 152 in FY 2012, the fewest since CAGW published the first Congressional Pig Book in 1991. The cost has decreased by 80 percent, from $16.5 billion in FY 2010 to $3.3 billion in FY 2012, the lowest amount since 1992. "The bad news is that the moratorium on earmarks has been breached by Congress. "Since Congress declared the 2012 appropriations bills “earmark-free,” there are no lists of which members requested the earmarks or the location and purpose of the expenditures, which is a disturbing departure from the transparency of the past several years. Therefore, there are numerous opportunities for members of Congress to contact federal agencies after the fact and request that money to be directed to a district or state for the programs that have received mini-“slush funds,” despite the requirement that the money be spent competitively. "For example, there is an $8.4 million earmark for Heritage Partnership Programs through the National Park Service, which has received 48 earmarks since 2001 worth a total of $28.7 million for a wide variety of initiatives, including park improvements, sports complexes, bike paths, and agricultural tourism. There is a $5 million earmark for abstinence education, which was not requested by the Department of Education; that program has received 126 earmarks since 2001 worth a total of $8.2 million. The Office of National Drug Control Policy got an earmark of $38.5 million for the high intensity drug trafficking areas program, which has received 28 earmarks since 1997 worth a total of $117.5 million. Based on an Executive Order issued by President Bush and a similar memo from President Obama, federal agencies should release the contents of any contact from members of Congress seeking a specific expenditure; i.e., an earmark, to a district or state outside of the competitive process." "$9,500,000 for high energy cost grants. Such grants are available for “improving and providing energy generation, transmission and distribution facilities serving communities with average home energy costs exceeding 275% of the national average.” Both the Bush and Obama administrations targeted high energy cost grants, which are duplicative of the Department of Agriculture’s Electric Loan Program, for elimination. Apparently members of Congress did not get the memo. "$810,000 for a guaranteed subsidy. The U.S. government occasionally guarantees loans taken out in the private sector, which means the government assumes all risk for its part of the transaction. This results in lower interest rates for borrowers. In effect, this earmark is meant to account for expected losses from loans handed out by the RUS. Think the government can't be trimmed down to a more reasonable, more limited government, size? If not, take a few minutes to review the 20-pages of the 2012 Congressional Pig Book. They also provide a searchable database of pork projects. "There’s a reason Bill Clinton is on the stage tonight. When he was president, America enjoyed a booming economy and surpluses . . . Since he left the White House, things haven’t been quite as good. "But the story of why they haven’t been quite as good is more complicated than “Clinton isn’t around now . . . ."
Klein then goes on to post "three of the best analyses of what’s happened to the federal budget since 2001." Surprisingly, one of them was the "e21" analysis by Charles Blahous (here at the e21 or economics21 website and here at the Mercatus Center website). "In the face of ballooning federal budget deficits, people have been wondering how the Clinton surpluses evaporated. Indeed, between 1998 and 2001 and for the first time in decades, the U.S. budget was balanced. 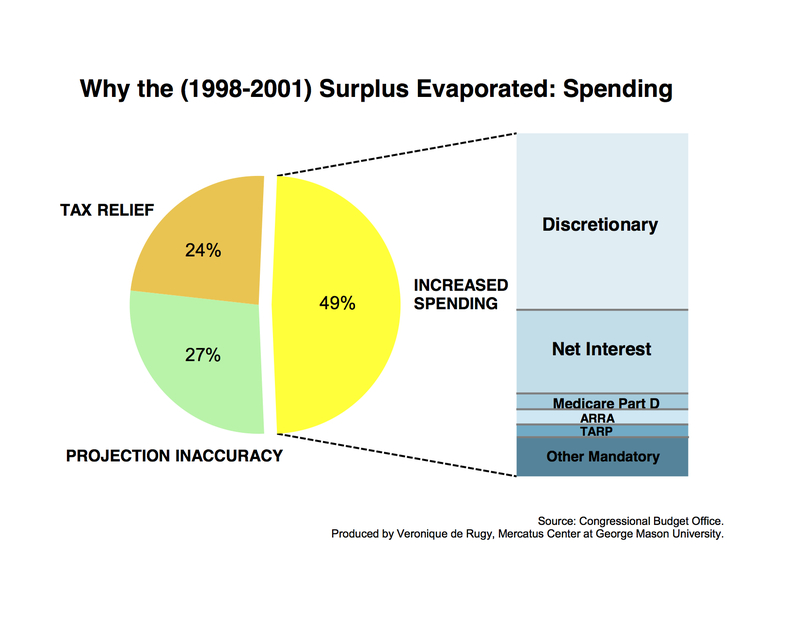 Using Congressional Budget Office data, these two charts—modified from the ones made by Charles Blahous in his e21 piece “How Did Federal Surpluses Become Huge Deficits?”—provide some answers to this question. 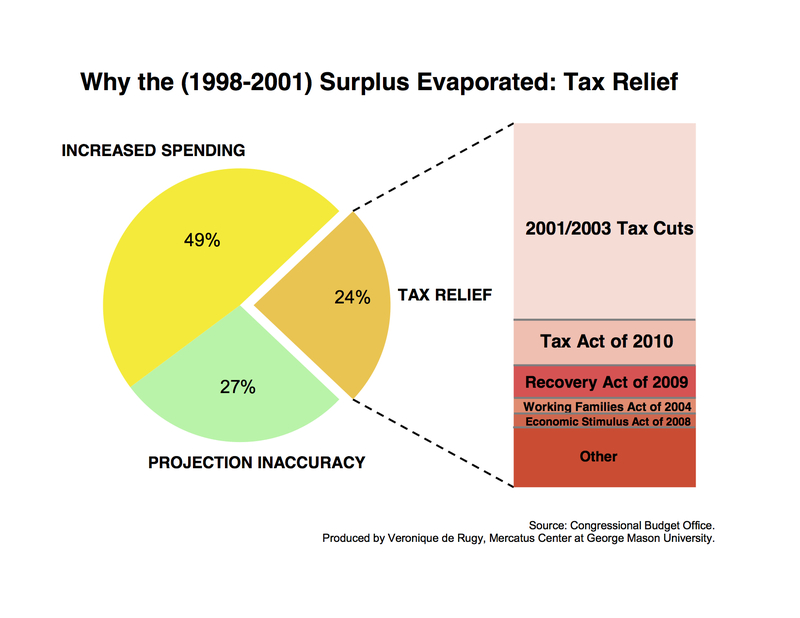 "According to the CBO, three areas have influenced the swing from projected surpluses to actual deficits over the 2002–2011 period: (1) increased spending, (2) a shortfall in tax revenue, and (3) projection inaccuracies. "As we can see on these charts, over the 10-year period, about three-fourths (73 percent) of the $12.7 trillion growth in federal debt was spending and tax legislation, the rest being the product of projection inaccuracies—such as expecting higher growth, increased revenue, or lower spending." Additional resources: At Business Insider, Joe Weisenthal tells the "untold story of how Clinton's budget destroyed the American economy. However, at Forbes magzine, Karl Whelan says "Weisenthal is right to be skeptical of the simplistic view that it is always good for the government to run surpluses or even balanced budgets . . . But using sectoral balances to reach back in time to blame Bill Clinton for the financial crisis is an argument that doesn’t fit the facts." Unfortunately, other than Klein's post at WonkBlog, a search at Google News found virtually no mainstream media coverage of how Clinton's budget surpluses "evaporated." So, Ezra Klein deserves our kudos for the day. "When Ben Franklin said the only guarantees in life are death and taxes, he got it only half right. In postwar America, death lets each generation pass the generational buck. Each generation leaves much of its fair share of taxes for generations to pay. "In taking from the young and giving to the old, year after year, decade after decade, in ever larger sums, Uncle Sam has, as indicated, run a massive Ponzi scheme. And he has sold his chain letter to the young with reassuring words that a Bernie Madoff might use: "Not to worry. Every dollar you hand over now in 'taxes' (wink, wink) will be repaid many times over when you hit retirement and collect the terrific benefits I've promised you." ~ Laurence J. Kotlikoff and Scott Burns, page 29, "The Class of Generations: Saving Ourselves, Our Kids, and Our Economy"
On Thursday, we growled about America’s declining economic freedom. Today’s we write about America’s corporate tax competitiveness, as noted in a Tax & Budget Bulletin (No. 65, September 2012, requires Adobe) from the Cato Institute. It was written by Duanjie Chen and Jack Mintz of the School of Public Policy, University of Calgary. “Corporate income tax reform is receiving serious consideration in Washington. The Obama administration has suggested reducing the federal corporate tax rate from 35 percent to 28 percent while broadening the tax base. Presidential candidate Mitt Romney has said that he would cut the corporate tax rate to 25 percent if elected. “The urgency of tax reform increased when Japan recently enacted a reduction to its corporate tax rate. That left the United States in the uncompetitive position of having the highest statutory tax rate in the world, with a combined federal-state rate of about 40 percent. “This bulletin presents new estimates of marginal effective tax rates (METRs) on corporate investment for 90 countries. These tax rates take into account statutory rates plus tax-base items that affect taxes paid on new investment, such as deductions for capital depreciation, inventory costs, and interest expenses. We ignore temporary incentives because they do not support sustained capital investment, but instead shift investment from the future to the present year. “Growing numbers of tax experts and policymakers recognize that the U.S. corporate tax system is a major barrier to economic growth. The aim of corporate tax reforms should be to create a system that has a competitive rate and is neutral between different business activities. That's the short version, obviously. Read the entire paper; it's only four pages, including several helpful graphics. You'll surely come away with an understanding of why corporate tax reform is essential to enhancing America's global competitiveness. Congress and the President need to start worrying about growing America’s economy rather than growing government. Why can’t they get that through their heads? The first wave involves the expiration of the 2001 and 2003 tax relief, the so-called Bush tax cuts. The second wave will the Obamacare Tax Hikes, which are the "twenty new or higher taxes in Obamacare" although "(s)ome have already gone into effect (the tanning tax, the medicine cabinet tax, the HSA withdrawal tax, W-2 health insurance reporting, and the “economic substance doctrine”)." The third wave includes the Alternative Minimum Tax and several others. The ATR post has the needed details on the specific taxes involved. Will Congress find the chutzpah to forestall Taxmageddon as well as the "fiscal cliff" also scheduled to go into effect on January 2, 2013. Taxpayers for Common Sense (TCS) write about it in their weekly "wastebasket" article here. Here's how TCS concludes their piece entitled "Fiscal Cliff Jumping:"
"Lawmakers and the administration complain about the idiocy of sequestration and how it is irresponsible to let it occur as if sequestration dropped from the sky without warning. They’re right. It is irresponsible. In fact the only thing that would be more irresponsible is to simply undo it and ignore the deep budgetary hole we’re in. The markets were jittery last summer when a final deal to raise the debt ceiling was struck (that’s what gave us the Super Committee and sequestration). To not follow through on what the nation’s leaders promised to do is inexcusable. So how about this: cut spending and raise revenue in a smart and targeted way to reduce the deficit by trillions of dollars. Here’s one plan we at Taxpayers for Common Sense came up with, but Congress, feel free to use the Domenici-Rivlin plan, or the Simpson-Bowles plan, or put your heads together and come with a new plan. Just do it." Other resources: We've growled at least three times about Taxmageddon -- here, here, and here. And, at the Committee for a Responsible Federal Budget's blog, they show NPR's effort to breakdown the fiscal cliff. "The United States, long considered the standard bearer for economic freedom among large industrial nations, has experienced a substantial decline in economic freedom during the past decade. From 1980 to 2000, the United States was generally rated the third freest economy in the world, ranking behind only Hong Kong and Singapore. After increasing steadily during the period from 1980 to 2000, the chain-linked EFW rating of the United States fell from 8.65 in 2000 to 8.21 in 2005 and 7.70 in 2010. The chain-linked ranking of the United States has fallen precipitously from second in 2000 to eighth in 2005 and 19th in 2010 (unadjusted ranking of 18th)." "A few facts will help illustrate why economic freedom is so important. The freest quartile of countries had an average per capita income of $37,691, while the least free quartile had a per capita income of just $5,188 in 2010. The freest quartile grew at an average annual rate of 3.6 percent 1990-2010, while the quartile that was least free only grew at an average rate of 1.6 percent over the same period. Life expectancy in the freest quartile was 79.5 years in 2010, as contrasted with 61.6 years in the least free quartile. Those people who are more concerned about the poor than economic growth should take note that the poorest 10 percent in the least-free quartile only had a per capita income of $1,209 in 2010, as contrasted with a per capita income of $11,382 for the poorest 10 percent in the freest quartile. Greater economic freedom is also associated with more political and civil liberties. In sum, by almost any measure of human well-being, a person is far better off being in a country with a high degree of economic freedom than in one with restricted economic freedoms." "The U.S. economy has been the world's biggest for decades. It's also been among the freest. But that long run is over. And our position at the top will soon be history, too, if liberty isn't restored. "From 1980 to 2000, the U.S. was ranked one of the world's three freest economies in the Cato Institute's Economic Freedom of the World Report. "In the latest rankings, it has fallen to 18th, behind such bulwarks of freedom as Qatar, Estonia, the United Arab Emirates and Mauritius." "As our own John Merline reports, "The National Federation of Independent Business calculates there are more than 4,000 federal rules in the pipeline, and that just the 13 biggest ones would, if imposed in an Obama second term, cost businesses a total of more than $515 billion over four years." "It's no coincidence that America has had both a high degree of economic freedom and the greatest economic prosperity in history. "You can't have the latter without the former. It's particularly galling that Obama probably knows this, yet keeps moving the country in the wrong direction." In his blog post yesterday at the American Enterprise Institute's blog, AEIdeas, James Pethokoukis asks, and then answers his own question: "What’s gone wrong with the U.S. economy? Maybe it’s nothing more complicated than a sharp decline in economic freedom." "As Ronald Reagan so eloquently put it, “Freedom is never more than one generation away from extinction.” And while the latest edition of the Fraser Institute’s annual “Economic Freedom of the World Report” does not predict the end of the American economy, it does paint an alarming picture of the loss of our economic freedom during the last decade." "Our empirical work indicates that a one-point change in a country’s EFW rating is associated with a 1.0 to 1.5 percentage point change in the long-term annual growth rate, all else equal. It is worth noting that U.S. growth averaged 2.3 percent in the 1980s and 2.2 percent during the 1990s, but it fell to an annual rate of only 0.7 percent during 2000-2010. Without a reversal of undermining economic freedom, the future economic growth of the United States will be weak for many years to come." “No doubt there are people who are dependent on government due to circumstances beyond their control. But it's been a main thrust of this administration to make as many people dependent on government as possible — witness ObamaCare — and its motives haven't always been pure. “This is the administration from which comes a steady drumbeat of class warfare, that rails against the evil "1%" while seeking to redistribute their wealth, that supports the mob action of Occupy Wall Street, attacks those preaching personal responsibility as asking people to "fend for themselves" and tells the people who roll up their sleeves rather than hold out their hands, well, "you didn't build that." "The popularity of the legislative branch remains in the basement; perhaps by working together to pass these straightforward, “No-Brainer” bills, Members of Congress can gain some momentum toward reforming government, and demonstrate to the American people they still have plenty of neurons firing upstairs." "The DATA Act (H.R. 2146/S. 1222): Introduced by Rep. Darrell Issa (R-CA) and Sen. Mark Warner (D-VA), the legislation would greatly increase government transparency by building on the success of the USAspending.gov website, which provides public access to federal grant, contract, and other information. There is currently no standard for financial data collection, significantly hampering the usability of the current transparency websites. The DATA Act, a holdover from the 2011 “No-Brainer List”, would remedy that problem while also addressing waste and fraud. It passed the House this April with strong bipartisan support on a voice vote, but the Senate has inexplicably failed to take it up." Given the bills' bipartisan support, it would be interesting to know how Virginia's candidates for U.S. Senate George Allen (R) and Tim Kaine (D) and the candidates for Virginia's 8th Congress district Rep. Jim Moran (D) and Patrick Murray (R) stand on the DATA Act and each of the nine other "no brainer" bills that are listed in the NTU Issue Brief. Taxpayers may want to ask the candidates at the candidates' next townhall meetings. The voter registration deadline is Monday, October 15, 2012. For more information, visit the Office of Voter Registration website. "Today, Sept. 17, 2012, marks the 225th anniversary of the signing of our Constitution at the Philadelphia (Constitution) Convention in 1787. The best way to honor the day might be to read it. It's up to "We the People" to hold our elected representatives accountable for failing to honor their oaths." Read more about Constitution Day, including extensive reference material, at Patriot Post. The Arlington Sun Gazette carried two quite detailed stories in August that I missed (HT Wayne Kubicki). Both concern the possible (probable ?) impact that higher office-vacancy rates could have on residential property taxes. "Office-vacancy rates across Arlington are on the rise, and if the trend continues, the county government could lose a cash cow and homeowners could bear the brunt in the form of higher taxes. "The overall vacancy rate for commercial property countywide was 13.4 percent in the second quarter of 2012, according to figures from CoStar reported by Arlington Economic Development. That’s an increase from 12.9 percent in the first quarter and was up from 9.3 percent a year ago. "Arlington’s vacancy rate remained below the Northern Virginia average of 14.9 percent in the second quarter, but many other commercial corridors across the area have been showing an improvement even as vacancies rise in Arlington." "Arlington’s elected leaders acknowledge they are wary of the high level of office-vacancy rates in the county, but are not ready to hit the panic button just yet. "“It’s a concern. Not a huge concern, but something you need to be aware of,” County Board member Libby Garvey said in response to news that the overall vacancy rate for commercial space in Arlington grew to 13.4 percent in the second quarter of 2012, and reached 18.6 percent in Crystal City. "Those rates had been 9.3 percent and 10 percent, respectively, a year before. "Garvey’s level of anxiety was shared, perhaps a touch more aggressively, by County Board Chairman Mary Hynes. "For each of the past two years, increasing commercial assessments have kept real estate tax rates for homeowners from rising more than they might have otherwise. Higher vacancy rates could have an impact – both macro and micro – on assessed values of commercial real estate across the county, since net income of properties is one key factor in the county’s arriving at assessed valuations. "Commercial-property values increased by 13.5 percent, to $30.1 billion, from 2011 to 2012, and now represent 49 percent of the overall county tax base. That’s up from 45 percent last year – more than double most neighboring jurisdictions. "Such a large commercial base brings in hundreds of millions of dollars in revenue to the county government’s coffers, while requiring just a fraction of the total in services." The two articles are well-worth spending a few minutes to read in their entirety since the value of Arlington County's commercial real estate has such a major impact on the taxation of residential real estate. "Former Governor Tim Kaine’s plans would add an estimated $1.28 billion to the federal budget; and former Senator George Allen seeks to cut $97.74 billion. Compared to the current fiscal year’s outlays, Kaine’s annualized average would represent an increase of .04 percent, while Allen’s would represent a decrease of 2.7 percent." Reform "No Child Left Behind"
NTUF noted that both candidates "agree on one major cost saver: drilling for oil off the Virginia coast." "For the study, NTUF gathered information from the campaigns and media coverage on any proposals by the two leading Virginia Senate contenders that could impact federal spending. Cost estimates for these items were verified against independent sources such as the Congressional Budget Office, and through NTUF’s BillTally system, which since 1991 has tracked all spending bills in Congress. "NTUF identified 24 items in Tim Kaine’s platform that could affect federal outlays, six of which would increase spending, none of which would decrease spending, and 18 of which could not be quantified with reasonable precision. George Allen’s agenda included two proposals to increase expenditures, 10 to lower them, and 16 with impacts that could not be pinpointed." Take a few minutes to study the details of NTUF's analysis so that you are more informed about the positions of the two candidates. "Real median household income reached its peak at $54,932 in 1999, 8.9 per cent above its current level, under President Bill Clinton and has not been below $50,000 since 1995. Under President George W. Bush, it fell to $52,778 by 2004 before recovering to reach $54,489 in 2007 and then sliding again in 2008." "The main culprit behind increasing poverty rates and income inequality is the high and persistent level of the unemployment rate. There is a large pool of people in the ranks of the unemployed who have seen their standard of living drop substantially. In addition, many individuals have accepted lower salaries, or part-time employment. People with the least amount of skill are impacted more by the dismal job market." "Meanwhile, the national poverty rate eased to 15.0% in 2011, down slightly from 15.1% the year before. Some 46.2 million people fell below the poverty line last year, and one in five children were poor. "The poverty threshold for a family of four was $23,021. "Most experts were expecting an increase in poverty, but Census officials said a rise in the number of people working full time helped keep the rate in check." A sad state of economic affairs. Indeed. Let’s take a look at how much the member school districts of the Washington Area Boards of Education (WABE) get from the federal government, i.e., American taxpayers. The FY 2013 numbers aren’t posted yet, but the revenue sources for FY 2012 are (page 25 of the 2012 WABE posted at the APS website). Let’s see. The Chicago public schools with 403,770 students will spend $13,199 per student, and received about 21% inf federal subsidies over the past four years. It will receive $937.7 million in FY 2013. On the other hand, the 10 school districts in WABE have 644,115 students, but received $$353.2 million in federal subsidies from the federal government in FY 2012 (4.3% of total revenues of $8.3 billion, or a cost per student of $12,854. I recognize that I’ve mixed fiscal years, but I think I’ve made the point that there is a great deal of income redistribution being engineered by the U.S. Department of Education. References: For more information about the Chicago teachers strike, here's a Reuters report posted today. Here's the Associated Press take in the Washington Post updated today. Arnold Ahlert has this report at FrontPage Magazine. Finally, here's the September 10, 2012 report from the Education Intelligence Agency. 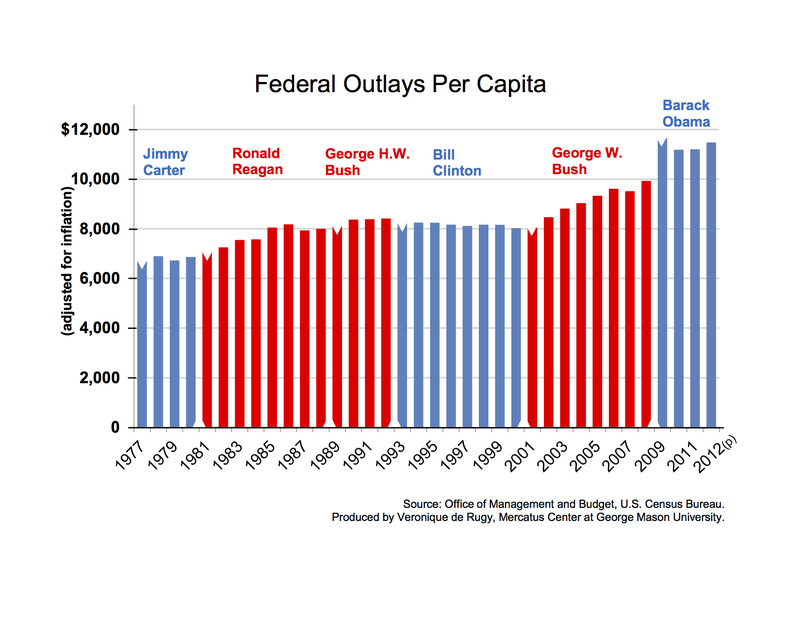 "Using data from the Office of Management and Budget, this chart shows the amount of real federal dollars spent per capita over the past 40 years. The data clearly highlight that, after adjusting for population and inflation, federal outlays have, with a few exceptions, mostly grown, with a clear increase over the past 12 years." The chart below shows that per capita spending slowly increased in a fairly narrow range from 1977 until the end of President Bill Clinton's second term. In fact, per capita spending under President Clinton actually saw a decline from $8,200 to $8,000. However, "that trend was radically reversed during George W. Bush’s two terms. President Obama’s first budget spent $11,600 per capita." Take a minute or two to look at the other charts, e.g. one shows the growth in the nation's Gross Domestic Product or the one showing federal spending as a percentage of GDP. August Jobs Numbers "Even Worse Than They Look"
"Don't be fooled by the headline unemployment number of 8.1% announced on Friday. The reason the number dropped to 8.1% from 8.3% in July was not because more jobs were created, but because more people quit looking for work." "The number for August reflects only people who have actively applied for a job in the past four weeks, either by interview or by filling an application form. But when the average period of unemployment is nearly 40 weeks, it is unrealistic to expect everyone who needs a job to keep seeking work consistently for months on end. You don't have to be lazy to recoil from the heartbreaking futility of knocking, week after week, on closed doors. "The key indicator of our employment health, in all the statistics, is what the government calls U-6. This is the number who have applied for work in the past six months and includes people who are involuntary part-time workers—government-speak for those individuals whose jobs have been cut back to two or three days a week. "They are working part-time only because they've been unable to find full-time work. This involuntary army of what's called "underutilized labor" has been hovering for months at about 15% of the workforce. Include the eight million who have simply given up looking, and the real unemployment rate is closer to 19%. "In short, the president's ill-designed stimulus program was a failure. For all our other national concerns, and the red herrings that typically swim in electoral waters, American voters refuse to be distracted from the No. 1 issue: the economy. And even many of those who have jobs are hurting, because annual wage increases have dropped to an average of 1.6%, the lowest in the past 30 years. Adjusting for inflation, wages are contracting. "The best single indicator of how confident workers are about their jobs is reflected in how they cling to them. The so-called quit rate has sagged to the lowest in years." At the American Enterprise Institute's blog, AEIdeas, James Pethokoukis posted the following chart on Friday showing the "average hourly earnings of private non-supervisory workers." According to Pethokoukis, it's "(o)ne of the most devasting charts showiong this is a non-recovery." For additional analysis of the August jobs report, see this Associated Press story posted by ABC News, this story at the LA Times, or this story in Forbes magazine. From the think tanks, there's this comprehensive Issue Brief #3719, dated September 7, 2012, from the Heritage Foundation. 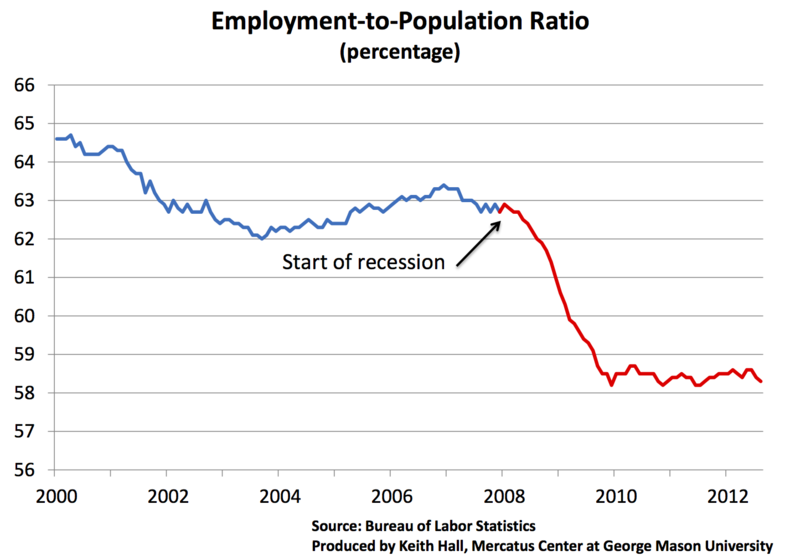 Finally, at the Mercatus Center, senior fellow Keith Hall posted the following chart, which he terms "the single most accurate indicator of labor market health:"
"When a new source of taxation is found it never means, in practice, that the old source is abandoned. It merely means that the politicians have two ways of milking the taxpayer where they had one before." Last month, we growled about 2,362 millionaires in 2009 who also received unemployment compensation (August 14, 2012). In addition, we growled about "mood disorder" being an acceptable disability diagnosis to receive Social Security disability benefits (August 24, 2012). "One individual GAO selected for further investigation received over $62,000 in overlapping benefits in a year. Based on GAO inquiries, state UI officials are reviewing the person’s UI eligibility because of earnings that may be related to work that makes the person ineligible for UI benefits." "The DI and UI trust funds face serious fiscal sustainability challenges. In addition to other services, both programs provide cash benefits to their targeted populations to replace lost earnings. DI is available to workers who are unable to engage in SGA because of physical or mental impairments expected to last at least 12 months or result in death. SGA is defined as work activity that involves significant physical or mental activities performed for pay or profit. UI provides temporary cash benefits to eligible workers who are able to work but remain involuntarily unemployed. "GAO was asked to determine the extent to which individuals received DI and UI benefits concurrently. To do so, GAO matched unemployment files with SSA disability files for fiscal year 2010. GAO also reviewed DI and UI case files for a nongeneralizable selection of 8 individuals – 4 from the top 50 recipients of concurrent DI and UI benefits in fiscal year 2010, and 4 who received UI benefits based on wages from multiple states. These examples cannot be generalized beyond those presented." Ah, the compassion and generosity of the world's brokest nation. And by bureaucrats earning on average far more than the average private sector employee. "Our long-term fiscal problems won’t be fixed until we address what might be our nation’s most serious fiscal-related problem: we’re increasingly becoming a European-style “entitlement nation,” with “payments to individuals” increasing both in absolute dollar amounts and as a share of total federal spending, while at the same time the share of Americans who face a zero or negative tax liability is above 40 percent and rising. 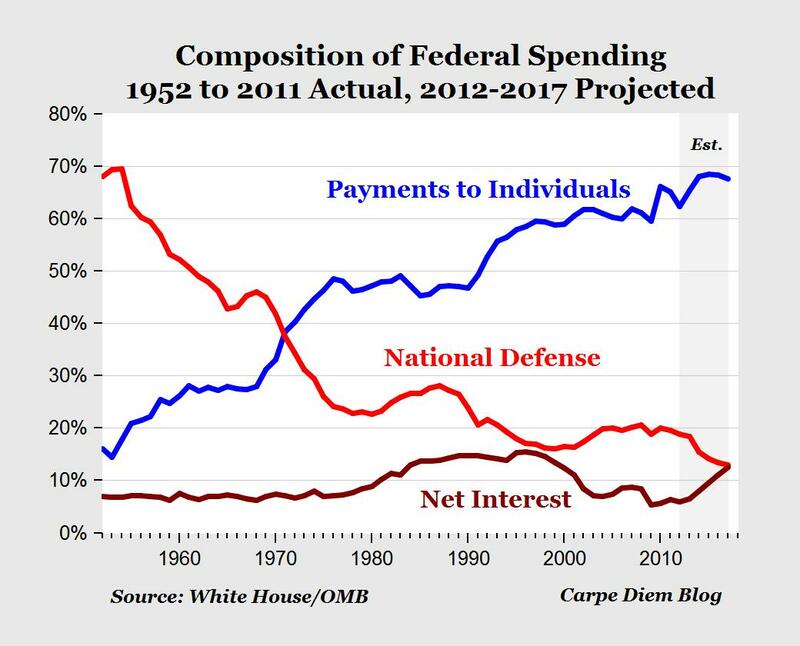 In other words, a declining share of American taxpayers is being forced to finance the rising cost of the federal government, which is increasingly being spent on payments to individuals. When will members of Congress stop the fiscal insanity? Read the entire post since Dr. Perry has another chart that shows how tax returns "with zero or negative tax liability" have changed over the sixty years from 2050 to 2010. "The Treasury Department said total government debt hit $16,015,769,788,215.80 on Friday, up $25 billion from the day before. The amount of federal debt subject to the borrowing limit is actually slightly less, as it doesn’t include several types of borrowing, and it stood at $15.977 trillion on Friday. "The government is projected to run a deficit of between $1.1 trillion and $1.2 trillion in the fiscal year that ends Sept. 30, meaning that spending will outpace tax revenue by that amount over 12 months. "The deficit remains large because of a combination of factors, though Democrats and Republicans are at odds over who is more to blame for the rising debt levels. Federal spending remains high and tax revenue remains low as a share of the economy, compared with prior years." Other resources for this reporting includes The Hill's blog, On the Money; Fox News; the Heritage Foundation's blog, The Foundry; and NewsMax. The Fox News includes a video with an interview of former White House economics adviser Austan Goolsbee. But the $16 trillion debt figure is merely the official, sanctioned accounting figure. A more worrisome figure is the fiscal gap as we growled about on September 1, 2012 and August 26, 2012. Including state and local governments, the fiscal gap now amounts to $260 trillion. And as Laurence Kotlikoff and Scott Burns explain in The Clash of Generations, that amounts to fiscal child abuse and a real war, a war on children. A Tough Five Years for Some NoVa School Districts? A little number-crunching of data in the Virginia Department of Education’s Superintendent’s Annual Report, specifically Table 17 (formerly Table 2) produced some interesting five-year trends. For example, when comparing the five-year (2006 vs. 2011) trends of enrollment data (i.e., average daily membership or ADM) and the change in the number of classroom teachers for the same five-year period. "An additional key message was that APS has the lowest overall pupil-teacher ratio when compared to peer Washington Area Board of Education (WABE) districts, at an estimated cost of $30 million per year. Recognizing that this is an academic investment that Arlington has chosen to make, Mr. Gibson encouraged the Board to be sure that it is getting the academic return on this investment. He also noted that this decision will be of particular ias capacity issues are becoming more significant in the schools." Arlington: Enrollment increased 21.2%. Teacher staffing increased 15.1%. Alexandria: Enrollment increased 20.2%. Teacher staffing increased 5.2%. Fairfax: Enrollment increased 8.3%. Teacher staffing increased 3.4%. Falls Church: Enrollment increased 21.2%. Teacher staffing increased 32.6%. Loudoun: Enrollment increased 31.4%. Teacher staffing increased 5.1%. Prince William: Enrollment increased 15.2%. Teacher staffing increased 11.7%. Virginia: Enrollment increased 2.8%. Teacher staffing decreased <1.7%>. So except for Loudoun County where there was a loss of efficiency in the ratio of pupils to classroom teachers, the other Northern Virginia school districts did become more efficient although in different degrees, assuming that results such as SAT and SOL scores increased or remained the same. Now let’s take a look at the secondary grades. Arlington: Enrollment increased 8.9%. Teacher staffing increased 2.6%. Alexandria: Enrollment increased 6.2%. Teacher staffing decreased <4.6%>. Fairfax: Enrollment increased 4.9%. Teacher staffing decreased <7.0%>. Falls Church: Enrollment increased 4.7%. Teacher staffing decreased <8.2%>. Loudoun: Enrollment increased 35.0%. Teacher staffing increased 21.1%. Prince William: Enrollment increased 13.2%. Teacher staffing decreased <6.2%>. Virginia: Enrollment increased 0.9%. Teacher staffing decreased <6.9%>. Again, Loudoun County remains the outlier in this analysis. Remember, though, that it is seeing a large increase in the construction of new schools. The remaining schools saw increases in their secondary efficiency, including the Arlington Public Schools, given the same assumption as above about student scores. It would be fair to say the years 2006 -- 2011 were years of varying degrees of fiscal stress. Consequently, it’s interesting to see how the different school districts responded to that stress. In our August 26 Growls a few days ago, we cited last weekend's Mark Steyn column in which he argued that unlike the "wars" of the progressive Left, the real war is against children, going so far as to use the phrase fiscal child abuse. Since Steyn mentioned the work of Boston University economics professor Laurence Kotlikoff, we included several of Kotlikoff's columns at the end of the article. "Thanks to six decades of incredibly profligate and irresponsible generational policy, we can declare, The United States is bankrupt. "And the United States isn't bankrupt ten, thirty, or fifty years from now. It's bankrupt right now. Indeed, the United States may be in worse fiscal shape than Portugal, Ireland, Italy, Greece, or Spain (referred to as PIIGS), which are generally viewed as the developed world's worst fiscal basket cases. "Yes, you read that number right. Our fiscal gap -- the value in the present (the present value) of all our future spending obligations (including servicing the official debt), net of all our future tax receipts, is enormous. It is fourteen times our nation's GDP, its total output. It is twenty-two times the official debt that now has everyone's attention. Note 1. In a Bloomberg News column, dated August 8, 2012, the authors updated the fiscal gap, writing that it has grown another $11 trillion, and now totals $222. Yet virtually all of the Congressional masterminds seem like lemmings headed towards the "fiscal cliff". UPDATE (9/2/12): On page 33 of Clash of Generations, Kotlikoff/Burns note that the state and local governments fiscal gap is about $38 trillion, bringing the total fiscal gap to some $260 trillion. Seeming to intuitively sense the terrible economic news about inter-generational theft, on Tuesday, Rasmussen reported that "just 16% see a better future for today's children."